"closed" by thin, membranous diaphragm-like structures. Fenestrae are not fixed structures; their frequency and location can be influenced by cytokines, ischemia reperfusion, growth factors, and other stimuli. An extreme form of fenestrated endothelia, termed discontinuous endothelia, are found in the sinusoids of the liver, spleen, and bone marrow. These endothelia have irregular outlines and calibers and highly fenestrated structures; in the liver, the fenestrae are often clustered to form sieve plates, and none of the fenestrae are closed with diaphragms (Figure 1). Endothelial diversity goes far deeper than appearance alone. In recent years, scientists have begun to appreciate the breadth of endothelial specialization, at the biochemical, metabolic, and immunological level. The endothelial surface is a highly specialized feature. This is the "face" the endothelial cell presents to the nutrients and formed elements of the blood, and not surprisingly, this surface exhibits remarkable specificity. One exquisitely localized property is the composition of the endothelial glycocalyx, in which differences have been revealed by the binding patterns of labeled lectins. For example, wheat germ agglutinin (WGA), when perfused through the vasculature of mice or rats, will bind to the luminal surface of endothelial cells in capillaries and arterioles, but not in venules (Figure 2). This selectivity is impressively abrupt; capillary endothelial cells will bind WGA strongly, whereas immediately adjacent venular cells do not. WGA interacts with N-acetylglu-cosamine and sialic acid glycoconjugates; thus the display of these glycoconjugates is highly regional . Table I Different Markers of Endothelial Specialization [1, 5]. Desmoplakin Lymphatic endothelial cells adhesion molecule-1 (Mad-CAM-1) is expressed primarily on high endothelial venules in Peyer's patches; GlyCAM-1 is also restricted to high endothelial venules. Postcapillary venules are the site of leukocyte adhesion and emigration, partly because of regio-specific cell adhesion molecule expression. For example, P-selectin is constitutively expressed by venular endothelial cells in most organs; however, it is absent or present only at very low concentrations in arteriolar and capillary endothelial cells. In vivo, the leukocyte adhesion molecules VCAM-1 and E-selectin are also selectively expressed by venular endothelial cells when activated by inflammatory cytokines or other mediators. Other factors contributing to this "local zip code" include the selective secretion of certain chemokines, cytokines, and differences in shear stress (see following sections for further discussion of physical forces). Table I summarizes the expression of several vascular bed-specific endothelial cell markers. The early topographic studies of Majno  were the first to recognize that the topical application of histamine or serotonin to the rat cremaster muscle selectively induced permeability in the venules. The list of inflammatory mediators that selectively induce venular responses is impressive and includes substance P, leukotriene B4, bradykinin, tumor necrosis factor, lipopolysaccharide, and ischemia-reperfusion injury. Moreover, these venular-specific responses have been observed in many organs, including cremaster muscle, diaphragm, trachea, cheek pouch, skin, bladder, stomach, pancreas, and intestine. At least some of this specificity is a result of different densities of the specific receptors for these mediators on venular endothelial cells; there may be additional contributing factors such as differences in downstream signal transduction. There are remarkable differences in the baseline permeability of different vascular beds to low-molecular-weight compounds as well as to large proteins. The exchange of these molecules across the endothelium can occur through the endothelium (by specific transporters, or by "vesicular transport") or between endothelial cells (i.e., at the endothelial junction). Obviously, the architecture of the endothelial junction plays a critical role in the roles of these different exchange pathways. There are also differences in the expression of different transporters and plasmalemmal vesicles from one vascular bed to another. For example, plasmalemmal vesicles are rarely seen in brain endothelia, yet are relatively frequent in the endothelial cells of the lung and diaphragm. The endothelium of the brain, which forms the so-called blood-brain barrier, plays a particularly important role in regulating the transport of solutes from the apical to basal surface; brain endothelial cells have specific transport systems for certain nutrients such as glucose (Glut-1) and amino acids. The endothelium of the brain also expresses the multidrug-resistance protein P-glycoprotein (mdrla), an active transporter that transports low-molecular-weight molecules from the basal to apical surface, thus protecting the cells of the central nervous system from accumulating potentially neurotoxic molecules. Organs with discontinuous endothelia, such as the liver capillaries, are quite permeable, and albumin escapes at a rate several fold greater than from less permeable continuous-type capillaries of muscle and skin. Endothelial cells are the source of some potent molecules that influence the contractile state of vascular smooth muscle cells, including the vasodilators nitric oxide (NO), prostaglandin (PG)PGI2, endothelial-derived hyperpolariz-ing factor (EDHF), adrenomedullin, and the potent vasoconstrictor, endothelin-1. PGE2, made predominantly in microvascular endothelial cells, may be a vasodilator or vasoconstrictor, depending on the concentration, interactions with other autocoids, and the vascular bed. The balance of these factors is an important determinant of the control of vascular tone and tissue perfusion; considerable heterogeneity of responses exists among vessels of different size from different anatomic origins and different species. As discussed previously, differences in endothelial cell-to-cell junctions in different vascular beds has long been recognized. During the last two decades, much has been learned about the biochemical and molecular constituents of the endothelial junction and their regulation. The inter-endothelial adhesive structures include tight, adherens, and gap junctions, in which the surface proteins occludin, claudins, cadherins, platelet endothelial cell adhesion molecule (PECAM), CD99, and junctional adhesion molecules (JAMs) are specifically incorporated. Tight junctions, defined structurally as closely opposed neighboring plasma membranes that appear to be tightly fused, are especially well developed in the brain and retina; occludin and claudin are the cellular marker proteins of this type of junction. Adherens junctions, defined morphologically by a cyto-plasmic plaque structure of electron-dense material on the plasma membrane of adjacent cells, are ubiquitously expressed in endothelia of all vascular beds; cadherins, in particular vascular endothelial (VE)-cadherin, are the endothelial marker protein for this type of junction. Gap junctions are characterized by their morphological appearance as a patch on which the membranes of two adjacent cells are separated by a uniform narrow gap of 2 to 4 nm; connexins, in particular connexins (Cx) Cx37, Cx40, and Cx43, are the marker protein for this type of junction. This "gap" is spanned by channel-forming proteins (the con-nexins) that allow inorganic ions and other small water-soluble molecules to pass from the cytoplasm of one cell to another; gap junctions thus couple cells both electrically and metabolically. There is considerable heterogeneity in the expression of some of these junction-associated molecules. For example, occludin, a structural component of the tight junction, is highly expressed in epithelial cells and in brain endothelial cells, yet barely detectable in endothelial cells of most other organs. Junctional adhesion molecule (JAM)-B (JAM-2, VE-JAM) is highly localized to the intercellular boundaries of high endothelial venules; JAM-A (JAM-1) is more highly expressed in brain endothelia, whereas JAM-C (JAM-3) is more broadly expressed in endothelia of different vascular beds. JAM-1 may be an organizer of occludin clustering, thus contributing to the establishment of tight junctions in certain endothelial cells. In the kidney, the expression of claudin 5, a component of tight junctions, is restricted to arterial endothelial cells but undetectable in veins and capillaries. Other junctional molecules such as vascular endothe-lial cadherin (VE-cadherin) and the connexins seem to be more ubiquitously expressed. The total surface area of the vascular endothelium is impressive: 100 to 700 m2. This surface provides an interface for nutrient transport, metabolism of bloodborne substances, and secretion of chemokines, cytokines, vasoactive peptides, enzymes, and other biologically active factors. The lung, because of its large surface area and its position as recipient of the entire cardiac output, is an important site of metabolism of both native molecules and xenobiotics. The architecture of the pulmonary capillaries, sandwiched between adjacent alveolae, provides a system in which blood flows through these vessels as if between sheets, providing for maximal exposure of the capillary blood to alveolar gases. Surprisingly, relatively little is known about the potential expression of specific metabolic enzymes in pulmonary capillary endothelia. Endothelial cells from the bone marrow are capable of promoting long-term multilineage hemopoiesis, in particular myelopoiesis and megakariocytopoiesis. The ability of these cells to support hemopoeisis may be a result of their ability to constitutively produce certain growth factors such as colony stimulating factors 1 and 2, fibroblast growth factor, leukemia inhibitory factor, transforming growth factor b, platelet-derived growth factor, interleukin-6, and kit ligand. steady and at low pressure. Flow patterns in the vicinity of curvatures and branch points create regions of turbulence in arteries; however, turbulence in veins is generally not seen. Flowing blood subjects the endothelium to two orthogonal components: viscous friction and distension. The frictional force per unit area acts tangential to the vascular wall and is known as wall shear stress. The distending force acts perpendicular to the wall and is essentially equal to the fluid pressure. The shear stress and the pressure stretch the wall, producing both longitudinal and circumferential strain. Endothelial cells are known to sense and respond to all of these hemodynamic challenges. Flow patterns dictated by vascular anatomy are now thought to play a crucial role in the origin of atherosclerotic lesions. 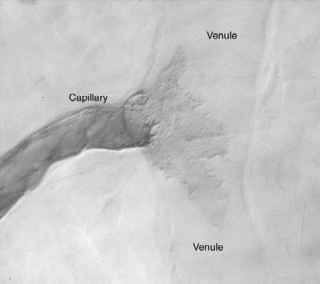 These lesions have a predeliction to occur at or near vessel bifurcations, regions exposed to nonuniform, complex flow. Interestingly, in vitro and in vivo studies comparing the effects of nonuniform complex flow to time-averaged, uniform flow, such as laminar shear stress, have revealed a remarkable difference in phenotype. Disturbed or turbulent flow is associated with the generation of reactive oxygen species by endothelial cells, followed by the expression of endothelial inflammatory markers, augmented endothelial turnover, and increased endothelial cell death. In contrast, the more uniform flow is associated with minimal endothelial cell turnover, low levels of apoptosis, and the expression of antioxidants and anti-inflammatory genes. There are quite likely inherent differences in the ability of endothelial cells at different vascular sites to respond to biomechanical forces; this is a relatively understudied aspect of endothelial heterogeneity. The basal lamina is a flexible, thin (40 to 120 nm thick) mat of specialized extracelluar matrix that separates the endothelium from the underlying tissue; it is composed mainly of type IV collagen, heparan sulfate proteoglycan, laminin, and nidogen/entactin (although the total number of proteins known to make up the basement membrane is at least 50). This so-called mat is far from inert or just structural; the basal lamina can influence cell metabolism, organize proteins in adjacent plasma membranes, induce proliferation, serve as a filter, act as a depot for various growth factors and other proteins, and importantly, serve as a specific highway for migrating leukocytes. Most basement membranes appear similar at the level of the electron microscope, but their composition is unique to each tissue. This molecular inequality is an important contributor to the differentiated state of the endothelial cell. The basement membrane of bone marrow sinusoids shows a distinctive structure: it is discontinous, lacks a network organization, and consists of irregular masses of amorphous material. It is also unusually abundant in chondroitin sulfate proteogly-cans and poor in heparan sulfate proteoglycan. This composition may facilitate disassembly and reassembly of basement membrane material as maturing hemopoietic cells pass through the sinusoidal wall. Tumors produce basement membrane components that promote angiogenesis, and additionally, cryptic domains within basement membrane molecules (such as the collagens) can be exposed during proteolytic degradation; some of these possess antiangio-genic activity . Pericytes, a type of mural cell associated abluminally with endothelial cells in capillaries and in some postcapil-lary venules, exhibit considerable variability in their relative association with endothelial cells in different tissues (for a review, see Ref. . For example, capillaries of the retina, lung, and skeletal muscle exhibit more pericytes and "coverage" of endothelial cells than capillaries found in endocrine tissues such as the adrenal gland. Pericyte coverage of newly formed blood vessels is also thought to play a role in the stabilization of these structures; the vasculature of tumors is poorly invested with pericytes. Endothelial cells isolated from various microvascular beds have been traditionally more difficult to maintain in culture than their counterparts from larger vessels such as the aorta, saphenous vein, and umbilical vein. 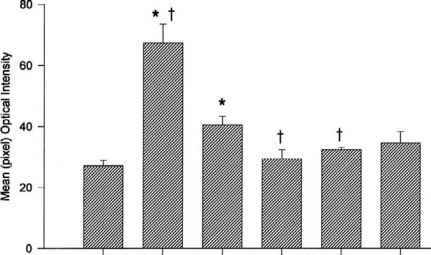 This is likely a consequence of multiple contributing factors: differences in growth factor synthesis and in growth factor receptor expression and signal transduction, harsher experimental conditions used to isolate the cells, and potential differences in the nutritional requirements (e.g., amino acids, carbohydrates, vitamins). A perusal of PubMed will quickly identify all of these as candidates, and more, in one or several publications. There are regional differences in endothelial "proliferative" states in vivo as well. For example, endothelial cells at sites of disturbed flow (e.g., branching of blood vessels, areas of curvature) exhibit a higher rate of BrDU labeling or proliferating cell nuclear antigen expression (indices of proliferation) compared to cells in adjacent regions of the vasculature exposed to laminar flow. Endothelial cells at the site of a wound, ischemia-reperfusion injury, or in reproductive organs such as the ovary or mammary gland undergo phenotypic changes consistent with the development of an angiogenic phenotype. The phenotypic characteristics of the endothelial cells in tumors are a hot topic of current research: the vision of specifically targeting the tumor vasculature offers an incredible therapeutic opportunity for the treatment of many solid tumors. A major contributor to the switch to the "angiogenic phenotype" is vascular endothelial growth factor (VEGF), a potent mito-gen, morphogen, and motogen for endothelial cells. Moreover, VEGF is a potent inducer of vascular permeability. Proliferating or angiogenic endothelial cells display different antigens, altered basement membrane composition, altered junctional morphology, and numerous transendothe-lial channels. Recent studies now indicate that there may also be vascular bed-specific endothelial cell growth factors; for example, endocrine gland-derived VEGF (EG-VEGF) is an endothelial cell mitogen selective for endocrine gland endothelial cells. Several approaches have been used to identify endothe-lial differences on a genomic scale, including differential display, suppressive subtractive hybridization, serial analysis of gene expression, and DNA and oligonucleotide microarrays [10-14]. Such studies have identified potential tissue-specific endothelial cell transcripts from cerebral, lymphatic, arterial versus venous, lung, nasal polyp, skin, and myometrial cells. At present these studies are too preliminary to cite the markers as fact, but they offer considerable promise for an improved molecular understanding of endothelial heterogeneity. 1. Garlanda, C., and Dejana, E. (1997). Heterogeneity of endothelial cells. Specific markers. Arterioscler. Thromb. Vasc. Biol. 17, 1193-1202. 2. Gerritsen, M. E. (1987). Functional heterogeneity of vascular endothelial cells. Biochem. Pharmacol. 36, 2701-2711. 3. Bennett, B., Luft, J., and Hampton, J. (1959). Morphological classification of vertebrate blood capillaries. Am. J. Physiol. 197, 381-390. The first attempt to distinguish endothelial cells based on their ultrastructural features. 4. Majno, G. (1965). Ultrastructure of the vascular membrane. In W. Hamilton, ed., Handbook of Physiology, pp. 2293-2375. Washington, DC: American Physiological Society. An early but thoughtful and insightful description and discussion of capillary structures and their diversity. 5. Wang, H., Chen, Z., and Anderson, D. (1998). Molecular distinction and angiogenic interaction between embryonic arteries and veins revealed by ephrin-B2 and its receptor Eph-B4. Cell 93, 741-753. 6. Thurston, G., Baluk, P., and McDonald, D. (1999). Determinants of endothelial cell phenotype in venules. Microcirculation 7, 67-80. A review of endothelial diversity in the setting of inflammation. 7. Majno, G., Palade, G., and GL, S. (1961). Studies on inflammation. II. The site of action of histamine and serotonin along the vascular tree: A topographic study. J. Biophys. Biochem. Cytol. 11, 607-625. 8. Kalluri, R. (2003). Basement membranes: structure, assembly and role in tumor angiogenesis. Nat. Rev. Cancer 3, 423-433. A detailed review of basement membranes. 9. Shepro, D., and Morel, N. (1993). 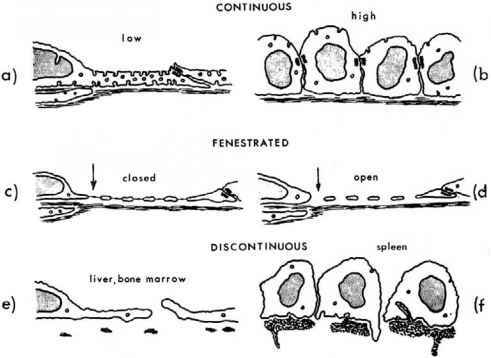 Pericyte physiology. FASEB J. 7, 1031-1038. 10. Chi, J.-T., Chang, H., Haraldsen, G., Jahnsen, F., Troyanskaya, O., Chang, D., Wang, Z., Rockson, S., van de Rijn, M., Botstein, D., et al. (2003). Endothelial cell diversity revealed by global expression profiling. Proc. Natl. Acad. Sci. USA 100, 10623-10628. 11. Girard, J.-P., Baekkevold, E., Yamanaka, T., Haraldsen, G., Brandtzaeg, P., and Amalric, F. (1999). Heterogeneity of endothelial cells. The specialized phenotype of human high endothelial venules characterized by suppression subtractive hybridization. Am. J. Pathol. 155, 2043-2055. 12. Kallman, B.-A., Wagner, S., Hummel, V., Buttmann, M., Bayas, A., Tonn, J., and Rieckmann, P. (2002). Characteristic gene expression profile of primary human cerebral endothelial cells. FASEB J. 10, 589-591. 13. Podgrabinska, S., Braun, P., Velasco, P., Kloos, B., Pepper, M., Jackson, D., and Skobe, M. (2002). Molecular characterization of lymphatic endothelial cells. Proc. Natl. Acad. Sci. USA 99, 16069-16074. 14. St. Croix, B., Rago, C., Velculescu, V., Traverso, G., Romans, K., Montgomery, E., Lai, A., Riggins, G., Lengauer, C., Vogelstein, B., et al. (2000). Genes expressed in human tumor endothelium. Science 289, 1197-1202. At the time this review was written, Dr. Gerritsen was working as an independent consultant for several biotech and venture capital firms. Currently she is the Senior Director of Molecular and Cellular Pharmacology at Exelixis Inc. She has held the positions of Senior Director, Vascular Biology, at Millennium Pharmaceuticals (2001-2002); Associate Director, Cardiovascular Research, at Genentech Inc. (1997-2001); Group Leader, Inflammation, at Bayer Corporation (1990-1997) and Associate Professor, Physiology, New York Medical College, 1985-1990. Her work has focused on the biology of the endothelium.